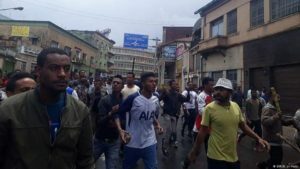 Ethiopia’s reformist PM Abiy Ahmed has called for calm in the wake of clashes between rival groups on the streets of Addis Ababa, ahead of the weekend return of the exiled Oromo Liberation Front leadership. The Oromo are Ethiopia’s largest ethnic group. The return the Oromo Liberation Front (OLF) comes after the return of the Patriotic Ginbot 7 group under an amnesty Abiy granted to all armed groups as part of the far-reaching reforms he has ushered in since taking office in April. Abiy himself is Oromo. Most of the OLF leadership have been in exile across the border in Eritrea. “Their supporters were trying to decorate the city with their flags – the OLF flag – to welcome them. The city dwellers and those from the outskirts – especially the youngsters – are not happy about that,” Befekadu Hailu, a local blogger, told DW. Media reports said young men armed with sticks and stones and holding flags favored by the Patriotic Ginbot 7 were involved in the scuffles on Thursday. Some Ethiopians on Twitter said gunshots rang out as security forces intervened. 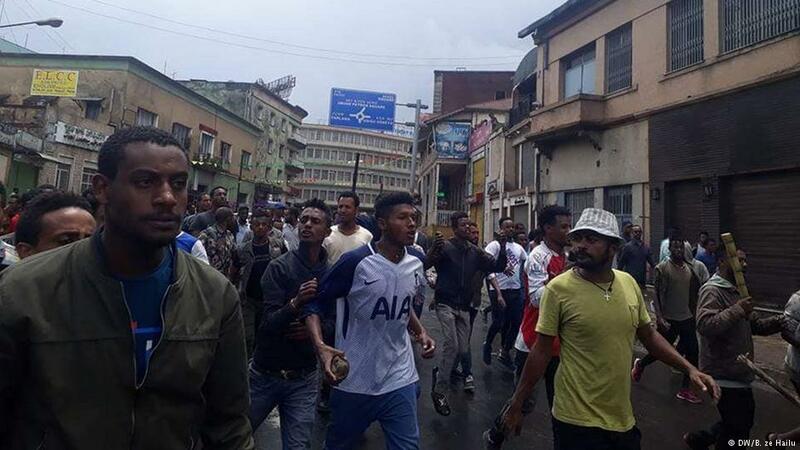 Police have since beefed up their presence in Addis Ababa, where such clashes are rare. Ethiopians have expressed concern and criticized those responsible for the violence at what is seen as a crucial time for the country. Like I tweeted yesterday….all really empty threats….REBELS WITHOUT CAUSE are getting no where….this is absurd DRAMA that is outrageously being written by the blood of the innocent….WHO is responsible?…..
“They rebelled because the system was repressive and it was difficult. So granting them amnesty was the right decision that the prime minister has done,” he said. Sporadic ethnic violence has continued in Ethiopia despite the dramatic political and economic transformation that has included an unexpected end to Ethiopia’s two-decade border war with Eritrea. Africa’s second-largest country based on population, Ethiopia is no stranger to ethnic violence – with over 80 ethnic groups, it is extremely diverse. Experts have warned that the deep-rooted tensions that frequently give rise to clashes have spiraled into a growing humanitarian crisis. The clashes in Addis Ababa came days after Ethiopia and Eritrea withdrew troops and opened borders.